Its brilliant, thank you very much for your work and making it free. I do have a question though. Could you please tell me how to remove the date and author tags off each page please as i dont see this to be relevant. I think its fine for posts etc but not on pages. First i would like to give you congratulation for your great theme.This is my favorite theme.I am using your theme in my two blogs now.My readers and viewers are also very happy. Hello: thanks for your theme but I found adjusting image size in Windows Live Writer no more work after using your theme. btw my email is fake. Thanks! Do you have any plans to move to bootstrap 3? sorry, I don’t have such a plan. 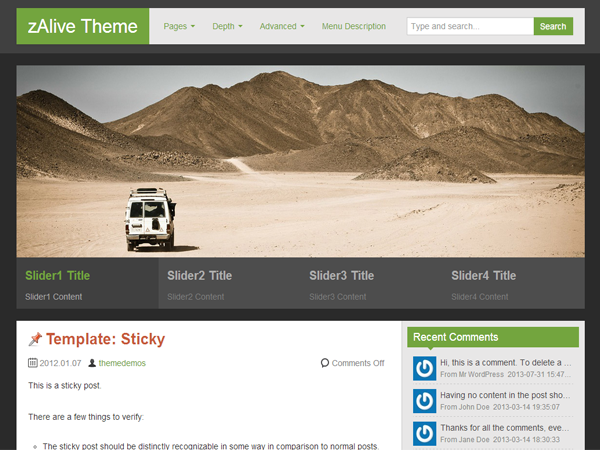 Great theme, I’m using it now on my wp blog. Good work! Hope you still makes updates for iton the future. Love your theme but have no idea when it comes to CSS, How can I remove author, date and Title from pages?